The universe's centre is everywhere, with its circumference nowhere. It is infinite, as are we. We have no centre, despite our ego’s inference that we are limited to the body and confined by the mind. What this means is that all things are the centre of the universe, which alternatively means that there is no centre at all, but rather just a continuously changing and interdependent co-arising of temporary manifestations. All things affecting all things. In truth, All things ARE All things. None is greater than or more important than any other, nor is any apparent thing less significant. There is only Absolute Unity, with no division whatsoever. This is the non-duality of All that Is. Just as the universe is beginning-less and end-less, so too are we, for our apparent consciousness is birth-less. It was not born, it arose. It appeared, no different than a ripple arising on the surface of the sea. Consciousness awoke and we opened our eyes, revealing a world that was already there—just as our apparent body was, awaiting us to perceive all of its sensory sensations. The truth of our reality is beyond the scope of human perception, it is timeless and eternal. It is deathless—and so too are we. I do not speak of the body, nor the mind. I speak of the true Self that is presently aware of these words; the consciousness that is cognizing the seeing that punctuates your present presence of beingness. Just as the eye cannot see itself and how the tongue cannot taste itself, the finite human mind can never truly comprehend that which is infinite. Nevertheless, we are the infinite and eternal presence of aware knowingness. We are a verb, not a noun. We are the knowing, but not anything we appear to know. Every moment is spontaneous, raw and new, never again to be repeated. It is unplanned, unrepeated and unscheduled. Every particle is part of the whole, with no division between any of its apparent parts, with every apparent element and every apparent thing forever transitioning and transforming, continuously dissolving and re-creating into something new. No thing is static, no thing is still. We are the wave that is waving, the breeze that is blowing—the dream that is dreaming. We are a dance of consciousness, within consciousness. This precise moment includes All that Is, and We Are That. It is only the finite mind that deceives us into identifying with the body thereby making it personal, turning it into a conceptual separate self, rather than a presence of being that is united with the totality of the universe that is an indivisible whole. No thing can be truthfully known without including the environment it is a part of. For us, that environment is the totality of all seeming things; the entirety of the cosmos. 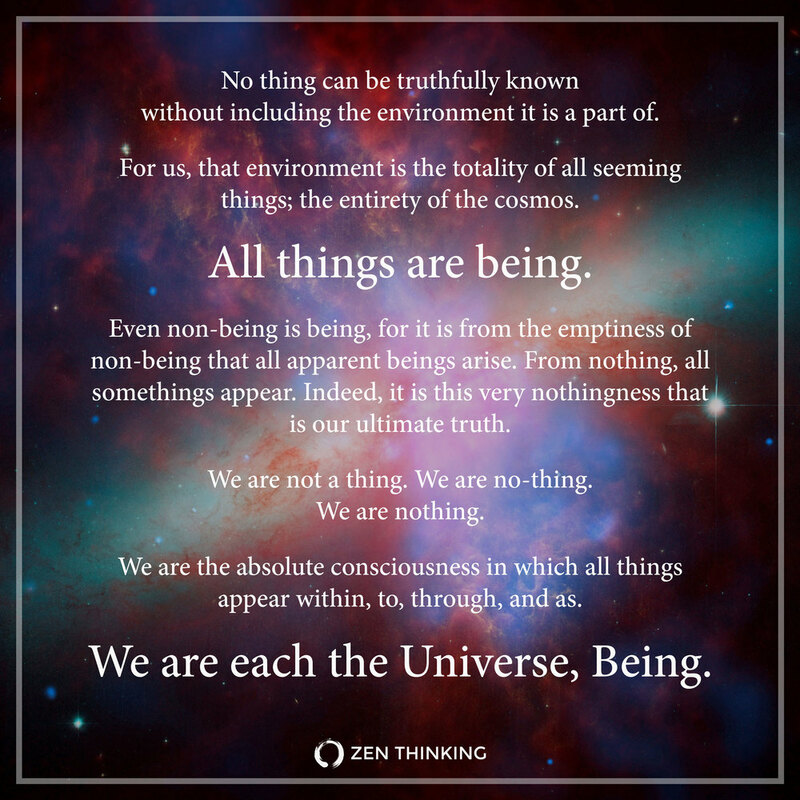 All things are being. Even non-being is being, for it is from the emptiness of non-being that all apparent beings arise. From nothing, all somethings appear. Indeed, it is this very nothingness that is our ultimate truth. We are not a thing. We are no-thing. We are nothing. We are the absolute consciousness in which all things appear within, to, through, and as. We are each the Universe, Being. The nothingness of the true Self is not unlike the bliss of deep sleep however. We seem to be unconscious while we’re deep within its cradle, but in truth we remain aware, but without any objects of sensory identification. In other words, there is no duality perceived by mind within deep sleep. There is no identification with that which we seem to be aware of. In other words, mind is not engaged by actively trying to translate its perceptions—there is only pure consciousness, empty of mind. This is the bliss of the true Self, that is, All That Is. So, to turn our conceptual understanding inside out, this impermanent human manifestation that we seem to temporarily be being, is in fact… our dream. Consciousness is not an object—it perceives apparent objects. Our truth is that we are consciousness perceiving its own creations. We are both the source and substance of all that Is. To awaken to this knowledge is to joyfully abandon any personal attachments and individual self-identity, understanding the utter foolishness and waste of emotional energy in trying to maintain and grasp that which is truly un-manageable, un-ownable and uncontrollable. A dream cannot be held, only known. We are the knowingness that knows. We are the awareness that is aware. To awaken to this truth of Self is to realize that this I Am, which I appear to be, is just another creative and playful momentary illusion that has arisen within the universal unity of awareness appearing within the void of the Absolute. Can you see how this present moment is imminent? It cannot be stopped. It is living. It is always arising anew. It is never the same. It is forever refreshed. And yet, it is always here and now. There is nothing other than This. And we are That. We are not a piece of That, or a segment of That—we ARE That. In other words, there is no drop of the ocean that is not the ocean. As above, so below. The vast nothingness of the entire cosmos is alive in infinite potentiality. No part, independent. No part, separate. All apparent parts integral and unified in its combined totality. From our infinite points of view, we see our Self. We know our Self. In truth, there is no-thing other than our Self. This is the dream that is the multiplicity of our mutual manifestation appearing within I, Awareness.